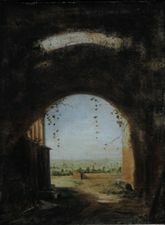 Hubert Robert (17233-1808). One of the most prominent artists of his era, Hubert Robert is perhaps best known today as “Robert of the Ruins,” the nickname bestowed on him by the eighteenth-century philosopher, critic, and encyclopedist Denis Diderot. Indeed, Robert loved and depicted ruined structures of all types, whether real or imagined, and not just those of ancient Rome (he lived in Italy for eleven years). He also drew inspiration from scenes he encountered in his native France, including urban renewal projects, Gallo-Roman antiquities, and natural disasters. At the core of his success was his brilliance as a master of the architectural capriccio, in which random monuments from different locales were artfully brought together to create new, completely imaginary landscapes. In addition to being a talented landscape painter, Robert was a gifted and prolific draftsman, an engaging printmaker, an interior decorator, and a garden designer. Lively, intelligent, and much sought after, this good-humored, well-loved bon vivant moved easily through the most exalted circles of Paris’s society, even though his own parents had been personal attendants in an aristocratic household. He later addressed the demise of this glittering world through representations of contemporary events such as the vandalizing of royalist monuments and the destruction of the Bastille prison during the French Revolution. Imprisoned himself, he narrowly escaped the guillotine and upon his release completed a series of meditative depictions of the newly created Musée du Louvre, where he served as curator until his death in 1808.